Godminster, which is best known for its famous ruby waxed organic cheddar cheese, is launching a new range of organic bries made with organic Jersey milk. The deliciously creamy hand-made cheeses (right) are available in three flavours; plain, with peppercorns or with garlic and chives. The cheeses are produced over the course of 7 days; during which time they are lovingly made by Godminster’s specialist cheesemakers in the traditional method. Organic Jersey milk is ‘set’ using vegetarian rennet and the soft curds are then hand cut before being scooped into individual moulds, hand turned, and then moved into a series of drying rooms for five days to allow the unique flavours and creaminess to develop. Finally the bries are hand wrapped. The bries have a rich creamy texture which develop into layers of flavour as the cheese ripens and are perfectly paired with Godminster’s hand-made biscuits and chutney. 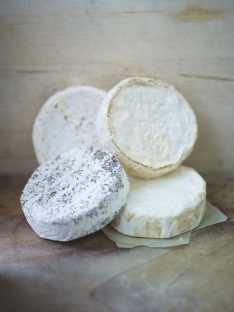 They bries are also a perfect size to bake, camembert style, and served as a sharing starter. Godminster’s three organic bries retail in the UK at £18.50 including postage and packaging at www.godminster.com or alternatively can be bought individually from delis and farmshops with an RRP between £3.50 and £4.50.